Nicky Nasrallah in Nicky's Solo Improvised Musical. Photo by Nicolas Melo. 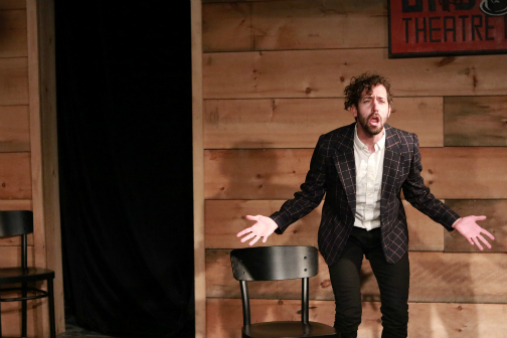 BOTTOM LINE: Nicky Nasrallah uses his musical theatre and comedic improv background to create a completely new musical on the spot. Nicky's Solo Improvised Musical is exactly what it sounds like. Nicky Nasrallah creates a never-before-seen production for each performance. As Nasrallah enters, he calls for the houselights to come up so he can begin with suggestions from the audience. At my performance, one audience member spoke of growing up in Cape Elizabeth, Maine, where the most notable thing is the lighthouse. Next question was for a woman in the back row who gave reasons why she would and wouldn't have liked being a veterinary technician. Then Nasrallah requested a secret that someone would be uncomfortable to reveal, which turned out to be excessive farting. Finally, he had someone name the show he was about to perform: A Saturday Afternoon Musical. Using these suggestions Nasrallah told the story of girl named Lynn and a boy named Ben who are both alone and looking for their place in the world. There were both upbeat songs and ballads, with "Shine the Spotlight" exploring “Who will listen to you outside the lighthouse?” and "Lynn's Time" explaining that sometimes it is your time to "get it in." He also sang a duet with himself and performed a ballet as a gorilla. While the performance I saw was certainly an indicator of Nasrallah's talent for comedy, it may not have been all he has to offer. The structure and variation illustrate Nasrallah's ability to understand storytelling, music, acting, and comedy. If Nasrallah doesn't have the most polished singing voice, he still manages to compose clever, funny lyrics on the fly, act authentically as multiple characters, and include surprising punchlines. Of course every one of his shows will be different, but I thoroughly enjoyed Nasrallah's creativity. Nicky’s Solo Improvised Musical is written and performed by Nicky Nasrallah. Keyboard alternatively by James Rushin, Austin Nuckols, or Caleb Collins.